VERY rare and simply fantastic, 1860's Civil War Quarter Plate Cased Tintype Photograph of two United States Army Soldiers - one armed with a Colt revolver featuring a large, American Flag backdrop!! This outstanding, period Tintype Photograph measures approx. 3 1/8" by 4 1/8" and is housed in a beautiful, Gutta Percha / Thermoplastic, Union Hard Case with original matt and binding and a replaced cover glass. 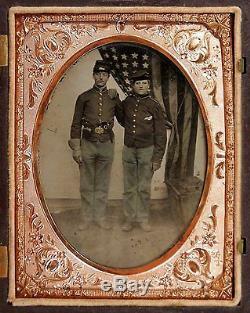 The Tintype is a wonderful, full length portrait of two Civil War Union "Pards" / Soldier standing arm in arm with the younger soldier at the right resting his right hand on his friend's shoulder and the older soldier on the left with his arm behind the other back. Both Soldiers wear shell jackets and blue tinted regulation trousers. The Soldier at the left wears a forage cap, leather gauntlets, a belt with oval brass belt plate and cartridge box. A Colt Revolver is displayed in his belt. The younger Soldier at the right wears a kepi and leather gloves but is unarmed. Neither the subjects nor the photographer are identified in any way. What makes this Image extra special is the large American Flag that hangs as a drape behind the two Soldiers - it appears that the Photograph was taken in a tent rather than in a Photographer's studio and the American Flag was used as a backdrop rather than the more common painted backdrop of a studio. Although the Flag is not hand colored, its presence is very dramatic making the Image a VERY special one! This very rare and wonderful, Civil War Tintype Portrait of a double armed Union Army Soldier is in very good condition. The focus is sharp, the contrast strong and the tonality rich and warm. The Tintype is clean and crisp and well preserved with a very few shallow bends and an oval scratch at the matt opening but no other but other significant surface scratches, scuffing or damage of any kind and no repairs. The surface is sound and stable with no crazing or flaking. Overall the Image is very well preserved and displays beautifully!! The Union Case is very beautiful and very well preserved. It is a rich, chocolate brown color and is geometric in pattern with identical front and rear halves. The pattern is designated as 3-22 Geometric by Berg. The Case is in excellent condition. The molded images on both sides are crisp and sharp with not even a hint damage or wear to even the highest points of the design. The surface is bright and retains its original brilliant surface shine. The corners are sharp and without chips and there are no significant edge chips, wear, cracks, repairs or damage of any kind. All of the eight corners are clean and without damage. An exceptionally rare and wonderful, 1860's Civil War Quarter Plate Cased Tintype Photograph of two United States Army Soldiers - one armed with a Colt revolver featuring a large, American Flag backdrop and a fantastic addition to any collection! And Click Here to Add Us To Your Favorite Sellers List. Click Here to Discover More About this Item and Many Others on Our New Informational / Non-Commercial / Reference Blog - Walnutts. The item "1860's CIVIL WAR 1/4 PLATE TINTYPE PHOTO OF UNION SOLDIERS with AMERICAN FLAG" is in sale since Friday, July 24, 2015. This item is in the category "Collectibles\Militaria\Civil War (1861-65)\Original Period Items\Photographs". The seller is "walnutts" and is located in Brewster, Massachusetts.